Apple iOS 11.3 is out. What’s good? Apple has release iOS 11.3 which bring a range of new features including their answer to the iPhone slow down issue for iPhones with degraded batteries. Other new features include Music Videos, new Animoji, update to the Health App, expanded HomeKit support, Business Chat and a number of other minor updates. You can now see if the power management feature that dynamically manages maximum performance to prevent unexpected shutdowns, first introduced in iOS 10.2.1, is on and can choose to turn it off. If you have a iPhone 6, iPhone 6 Plus, iPhone SE, iPhone 6s, iPhone 6s Plus, iPhone 7 or iPhone 7 Plus this could provide you with an instant speed boost. 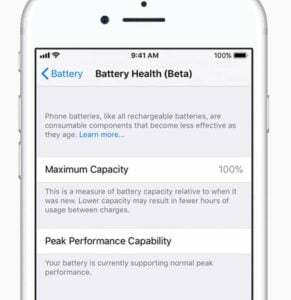 iOS 11.3 also allows you to view the battery health of an iPhone and recommend if a battery needs to be serviced. These can be found in Settings -> Battery and are available for iPhone 6 and later. Apple is also currently offering $39 (reduced from $119) battery upgrades until December 2018 if your battery shows it needs to be serviced. Improvements in iOS 11.3 allow apps to deliver AR experiences on vertical surfaces like walls and doors, in addition to horizontal surfaces like tables and chairs, and more accurately map to irregularly shaped surfaces like circular tables. Apple is introducing four new Animoji for iPhone X users: Lion, Bear, Dragon & Skull. Apple's strong commitment to security and privacy continues with iOS 11.3 (and macOS 10.13.14) by including a new privacy icon that shows up whenever Apple is asking for your personal information, like your Apple ID password, so that you can verify that the request is legitimate and from Apple. Business Chat is a new way for users to communicate directly with businesses using the Messages app on iPhone and iPad. The Health app adds a new Health Records feature to help patients view their medical records from multiple institutions right from their iPhone. As new health providers come on board patients will have greater access to their medical information including lab results, medications, conditions and more. Health Records data is encrypted and protected with a passcode. Apple Music now streams music videos uninterrupted by ads. Apple News adds a Video group in For You and improved Top Stories. HomeKit changes its support to include software authentication which will allow significantly more devices to be supported while continuing to protect privacy and security. Support for Advanced Mobile Location (AML) to automatically send a user’s current location when making a call to emergency services. Earlier versions of 11.3 had a couple significant features which have now been removed. Messages in iCloud did just what the name says and stored all your messages in the cloud and AirPlay 2 allowed multi-room playback and stereo pairing for HomePod. Hopefully these will reappear in a release soon. What’s new with the iPad announced today? High Sierra 10.13.4 released, what’s new?